Nokia has experienced mountainous ups and abysmal downs over the last decade. The Nokia 3.1 Plus is the brand’s re-entry to the U.S. after a few years’ absence. Make no mistake, returning to a U.S. carrier is a big deal. Nokia still has a lot of resonance with consumers. We know this because people across Asia and Europe have been snapping them up for two years. People who need affordable phones typically buy Android, and the same is true of people going to the stores of prepaid carriers such as Cricket Wireless. The Nokia 3.1 Plus offers a lot of bang for the buck, particularly compared to Cricket’s other offerings. The 3.1 Plus is well made, covers the core features, and puts some pricey flagships to shame when it comes to battery life. Will consumers flock back to Nokia? The 3.1 Plus gives us a good indication. We tested the Nokia 3.1 Plus in New Jersey over the course of a week. Many of HMD Global’s devices lean toward more spartan designs, and that’s okay. The Nokia 3.1 Plus is a simple slab. It’s a coherent platter that packs a lot into a pleasing form. This phone skips the metal to keep costs down. It has a polycarbonate frame and rear panel that feel soft. I wish the material didn’t collect fingerprints and smudges quite so quickly. The phone feels more robust than delicate, glass-backed flagships that cost far more. The shape is nearly seamless. Its 2.5D glass front flows smoothly into the rounded side edges, which in turn bend gently to meet the back surface. It’s a smooth phone with no hard edges or unpleasant angles digging into your flesh. It’s plain, but sometimes plain works. Cricket offers the Nokia 3.1 Plus in a blue that borders on purple. There are no black or white or other neutral colors available, though the blue is pleasant and helps the phone stand out. The phone is fairly large. It’s about the same size and shape as the Google Pixel 3 XL, meaning it stands more than 6.3 inches (162mm) tall and more than 3 inches (77mm) wide. The 18:9 aspect ratio means the phone has that tall and skinny look many modern devices sport. It’s not overly heavy, but the 3.1 Plus is still a lot of phone. The phone includes a 3.5mm headphone jack on top, a USB-C port on the bottom, and a fingerprint reader at the rear. I’m glad to see HMD Global opted for USB-C on such a low-cost device. Some devices from Alcatel and Honor in this price range still ship with microUSB. I’m also pleased about the fingerprint reader, which affords owners more security options. It’s easy to find and use. HMD stuck the power button and volume toggle on the right edge. The power button is the lower of the two and they both work as they should. The Nokia 3.1 Plus is a piece of hardware that you can rely on. The polycarbonate rear panel of the phone comes off with some prying. The slots for the SIM and memory cards are here, but you cannot remove the battery. The Nokia 3.1 Plus is not waterproof, so keep it safe from liquids. Nippon Electric hardened glass covers the front face of the 3.1 Plus. The edges and corners are rounded nicely and tuck into the polycarbonate frame snugly. The display is often the most expensive component of any phone, and HMD Global kept the screen’s specs in check to keep the price down. The LCD itself measures 5.99 inches and boasts HD+ (1,440 by 720p) resolution with an 18:9 (2:1) aspect ratio. This is about the lowest resolution I’d want on a screen this size. Your eyes won’t spot pixels, but it’s obviously not a Full HD screen. Colors represented on the display are accurate, and brightness is fairly decent. The LCD doesn’t deliver as much visual pop as a comparable OLED might, but it’s still fine, considering the price. I really like the rounded corners of the display. They match the curvature of the phone’s shape. The glass collects smudges readily, and that oily grime will obscure the screen sometimes when outside. The Nokia 3.1 Plus is a piece of hardware you can rely on. It’s sturdy, well built, and brings modern phone conveniences (USB-C, fingerprint reader, 2:1 screen) to the masses. HMD Global, bless its heart, decided early on to stick with clean versions of Android for its Nokia phones. The Nokia 3.1 Plus ships with the full build of Android 9 Pie (not the Android One variant that comes with some commitments to updates and security patches). You won’t find a UI skin mucking things up. The home screen appearance and behavior should be familiar to anyone who’s used an Android device before. Stock Android means a pair of home screens, with a dedicated app drawer and panel for your Google Feed. The drop-down Quick Settings menu and full systems menus are clean, organized well, and searchable. Some phone makers have fixed Android 9 Pie’s horrid multitasking and app drawer behaviors — for example, OnePlus with the 6T. HMD Global left the stock UI intact, which means it’s sometimes annoying to switch apps or open the whole app drawer. There are no junky apps from HMD on board, but the 3.1 Plus does ship with some Cricket bloatware. Cricket, AT&T’s prepaid carrier, included its account management app, visual voicemail app, a news app, and a handful of random games. I mention this because the phone has only 32GB of storage, only 18GB of which is available to end users — that’s not a whole lot. Thank goodness, then, for the memory card slot, which supports cards up to 256GB. The fingerprint reader is great. HMD saw fit to include an “ambient display.” You can set the screen to turn on periodically when new notifications arrive. It won’t remain on all the time, but at least incoming notifications briefly wake the display so you know there’s something waiting for your attention. Security options run the norm for a phone at this price point. The fingerprint reader is great. It’s easy to find, easy to set up, and easy to use. It should be quick enough for most people, and you can always rely on a PIN, pattern, or password as a backup. There’s nothing fancy like face ID, but Google’s stock Smart Lock features — which let you customize locking behaviors based on your location or accessories — are on board. The user interface’s performance feels a tad strained. The 3.1 Plus has a 2GHz octa-core Snapdragon 439 processor and 2GB of RAM. Screen transitions were not always snappy, and apps sometimes took a beat or two to open up. Performance wasn’t slow, but it wasn’t fast either. Looking at scores from the standard set of tests, the phone doesn’t impress. On average, it outperforms between just 20 percent and 35 percent of competing devices. It runs tests such as GeekBench and AnTuTu slower than phones that are more than two years old. Ouch. The device includes a Cat 4 LTE radio and runs well on Cricket’s (AT&T’s) network. Peak download speeds reached 33Mbps, with the average closer to 20Mbps. Upload speeds were pathetic, at just 1.35Mbps. That means your Instagram stories will be a pain to post. Overall, the phone carries a standard set of software features and runs well enough. There’s always the Play store for what it’s missing, too. The Nokia 3.1 Plus has a dual camera array on the back with a fairly typical set of shooting modes. The main lens shoots 13MP images at f/2 and the secondary 5MP sensor captures depth and contrast information at f/2.4. Shooting modes include auto, panorama, video, time-lapse, bokeh, and square. The most glaringly absent tools would be slow motion, and manual or pro modes. The bokeh tool is why the 3.1 Plus has two cameras on the back. HMD calls it “Live Bokeh.” This lets you adjust the aperture (or amount of background blur) in real-time as you take portraits of your friends and family. It’s kind of flaky. The focal plane is too narrowly defined, which results in shots where someone’s nose is in focus, but their ears aren’t. It takes a lot of tweaking to find the result you want. You’ll get the best results (the not hot garbage ones) if you keep the background blur to a minimum — which kind of negates the point of bokeh. The basic functions let you set resolution, aspect ratio, GPS tagging, HDR, timer, beauty mode, and motion photos. Photos look good for a phone in this price range, though they won’t stand up to today’s flagships. Focus is the 3.1’s strong point. The photos I captured looked sharp throughout and offered plenty of definition. White balance and color was mostly accurate with only a few outliers. Exposure was a bit inconsistent. Even with HDR turned on, the 3.1 Plus was prone to blowing out bright areas or under exposing dark areas. You’ll have lots of trouble taking pictures of people standing in front of windows during the day. We’ve created a gallery of full-resolution photo samples taken with the Nokia 3.1 Plus here. The 8MP, f/2.2 selfie camera has fixed focus and does a fairly decent job. If you’re outdoors during the day, selfie shots look clean and sharp. The selfie cam offers a good field of view so you can capture yourself and a fair bit of the backdrop. Some beautification software is available if you want to rid your face of blemishes. I find it makes you look more like a lifeless pancake than a rosy-cheeked cherubim. Both the front and back cameras can record full HD 1080p video. Footage from the main camera was sharper and more colorful, while video from the selfie cam was a bit grainy and dull. My biggest gripe with the camera is speed. It’s the slowest app on the phone, clearly limited by the processor and RAM combo. Transitioning between shooting modes is labored enough that you’ll miss shots from time to time. HMD endowed the Nokia 3.1 Plus with a capable 3,500mAh battery. I had a hard time draining it. Over a week of testing, the phone consistently pushed through a day and a half between charges. I ensured the display was set to “auto” brightness and all the radios were on. Daily screen time easily reached eight hours. The phone doesn’t support wireless charging, but it can handle Qualcomm Quick Charge 2.0. The included charger will power up a dead battery in a little over two hours. The Nokia 3.1 Plus is available from Cricket Wireless for $160. It’s one of the better deals Cricket offers right now. You could go for the excellent LG Stylo 4 or Samsung Galaxy A6, but they are pricier than the 3.1 Plus. Most of Cricket’s sub-$100 devices are somewhat dated. The 3.1 Plus is well suited to Cricket. The prepaid carrier has a gaping hole in the $99 to $199 segment, formerly occupied by ZTE. The 3.1 Plus rounds out Cricket’s offerings nicely. It’s great to see Nokia-branded phones back on store shelves in the U.S. 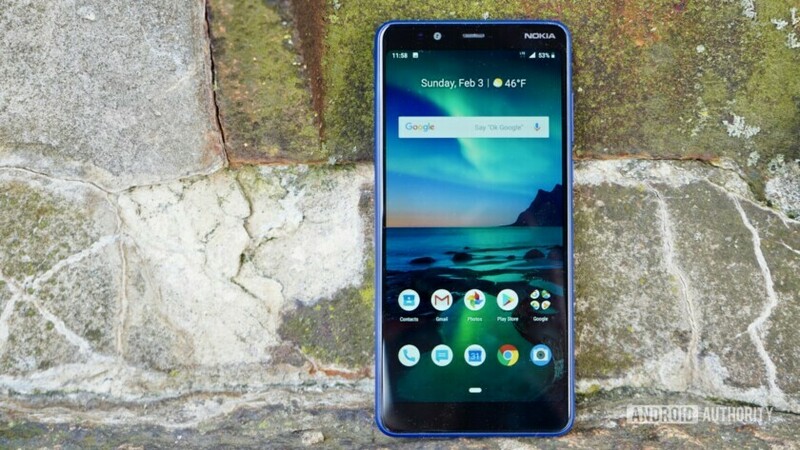 If you’re a Cricket customer and want something a little more exciting than some low-end Alcatel, LG, or Samsung phone, the Nokia 3.1 Plus is a solid contender thanks to its large screen, robust hardware, and long-lasting battery.